The Special Warfare Memorial Statue, also known as “Bronze Bruce,” was the first Vietnam memorial in the United States and was dedicated in 1969. 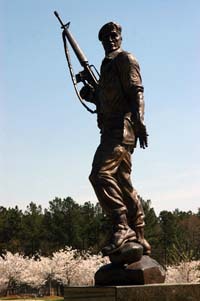 Since then, the statue has become the centerpiece of the U.S. Army Special Operations Command’s Memorial Plaza at Fort Bragg, N.C., and is symbolic of all the command’s Soldiers. A Special Forces Soldier was chosen as the model for the statue since nearly all Army special operations Soldiers killed in Vietnam were Green Berets. fully willing to help those in need. He is the perfect warrior from the past, a healer, a teacher and an opponent of evil. He serves all over the world today and willingly faces any mission. His is the standard to which all Army special operations Soldiers aspire. John F. Kennedy, and Kennedy’s speech presenting the green beret to Special Forces Soldiers. The cost of the statue in 1969 was $100,000. Both John Wayne, co-director and star of the 1968 movie “The Green Berets”, and Barry Sadler, composer of the song, “The Ballad of the Green Berets”, each donated $5,000 toward the creation of the statue as a symbol of the “Quiet Professionals”. Robert McNamara, the secretary of defense at the time, donated $1,000. Special Forces Soldiers from all over the world donated the remaining money needed to build the statue.